A monofenestratan pterosaur from the Kimmeridge Clay Formation (Upper Jurassic, Kimmeridgian) of Dorset, England. 2011. D.M. Martill and S. Etches. Acta Palaeontologica Polonica, in press. 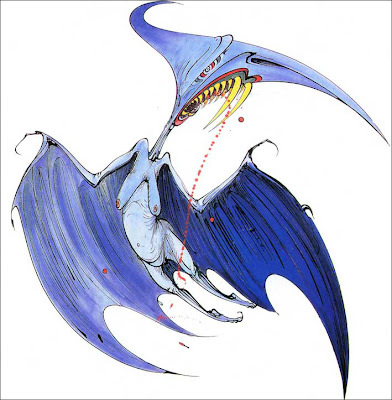 The pterosaur Cuspicephalus scarfi is named after Gerald Scarfe, the political cartoonist whose pen demonised Mrs Thatcher as a pointy nosed ‘torydactyl’. The new discovery was so-called because of its extremely long pointy head, which is most unusual for a pterosaur. The skull is 326 mm long – similar in size to a stork or heron. The species was found by fossil collector Steve Etches in Kimmeridge Bay, Dorset. The specimen is 155 million years old from the Late Jurassic period and is the most substantial pterosaur skull to be found in the UK for nearly 200 years. It is now on display in Dorset’s Museum of Jurassic Marine Life.